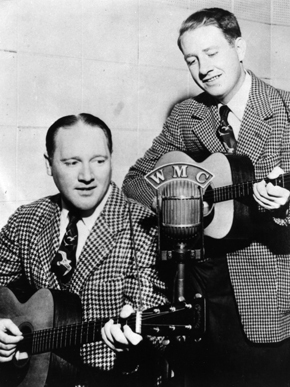 The Delmore Brothers were two of the top harmonizers of early country music, drawing musical influences from both the gospel and Appalachian folk traditions. Alton Delmore and his younger brother Rabon were also skilled songwriters, penning literally hundreds of classic country songs that have stood the test of time. Perhaps most importantly, however, the Delmores were among the very few early traditional country acts to change with the times. In fact, they were often in the musical vanguard in terms of pioneering some of that progress. Their recordings from the latter half of the 1940s blended traditional country with bluesy riffs and boogie-woogie beats. In this respect, the Delmore Brothers established a musical foundation for rockabilly and early rock ’n’ roll, rating among some of rock’s most significant white progenitors. The Delmores were born into poverty as the sons of tenant farmers in Elkmont. Performing on guitar and vocals from early childhood, they were playing as a pair by the time Rabon was turned ten. Alton would write most of the duo’ original material, although Rabon was an equally competent writer. 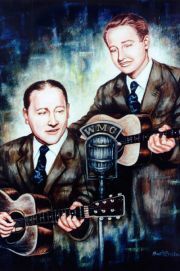 In the early 1930s, the duo was confident enough to enter professional music, auditioning for Columbia Records in 1931 and trying out for Nashville radio station WSM the following year. The brothers recorded often while performing live on a number of radio stations throughout the 1930s. They gained their greatest early fame, however, from their long-running tenure with the Grand Ole Opry from 1932 through 1938. Their music emphasized soft, beautiful harmonies, accomplished guitar picking and compelling original compositions. In an unusual approach for that time (or any other), the Delmores would switch high and low harmony parts from song to song (or even within the same song), although Alton would usually sing lead. Whether performing their own songs, traditional tunes or gospel numbers, the Delmores brought a bluesy feeling to both their vocals and their instrumentation. In addition, their down-to-earth lyrical concerns – which address themes of commonplace struggles and lost love with grace and good-natured humor – rarely resorted to the maudlin or overwrought. In 1944, the Delmores signed with King Records, inaugurating an era which found them delving into more modern and innovative forms of country. Although their first sides for the label adhered to a fairly strict traditional mold, by 1946 they had expanded their acoustic two-piece arrangements into full-band backup, featuring bass, mandolin, steel guitar, fiddle, harmonica and additional guitars. Some of those additional guitars were supplied by up-and-coming country artist Merle Travis, who credited Alton Delmore as a key influence. By the early 1950s – just after their signature tune “Blues, Stay Away from Me” climbed to No. 1 on the country charts – the Delmores’ commercial success began to fade. After the death of his young daughter, Alton drank heavily, and Rabon died of lung cancer at the age of 42. Alton – like longtime accompanist Raney – went on to record as a solo act in both the gospel and rockabilly fields before moving to Huntsville to work for the post office and teach guitar. He completed his autobiography, Truth Is Stranger than Publicity, with his son Lionel shortly before his death at the age of 55. By that time, the Delmore Brothers’ work had already influenced the harmonies of sibling acts like the Louvin Brothers and the Everly Brothers. In 1971, The Delmore Brothers were inducted into the Nashville Songwriters Hall of Fame. Twenty years later, they were inducted into the Country Music Hall of Fame.